I Am Mike D: Suprise! 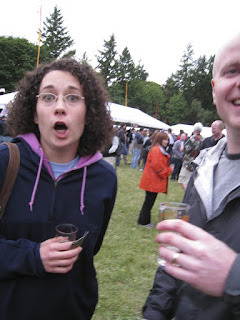 Went to the Washington Brewers Festival Friday after work and was joined by a few friends, family and wife. As usual, it was a good time. It is neat that the festival is held in my old stomping grounds where I grew up. I always run into a bunch of familiar faces that I haven't seen in awhile. 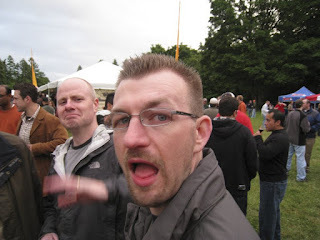 Here are some of my attempts at some candid photography. I left the big gun at home and used my little point and shoot. I don't want the thing to feel neglected. 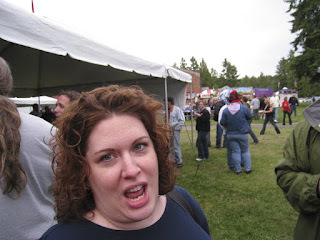 First, we have my sister-in-law Janelle looking suprised. Next, buddies Jeremy and Jeff. I think I scared Jeremy somehow. Finally my wonderful wife, Carrie. Most likely she is telling me not to take a picture. One of these days she will learn that it is best to just smile. Every year this event is one of my highlights. Sunday we will be back for the best fathers day activity ever.